The WRT Field Erected Systems are designed for various contaminant removal applications at any flow rate. Typically used for flow rates higher than 250 gallons per minute, a single treatment train can handle flow rates up to 1,750 gallons per minute. Parallel treatment trains then provide the ability to handle virtually any flow rate. WRT has provided systems with operating flow rates up to 3,500 gallons per minute. 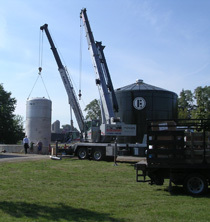 Field erected systems are shipped to the site as components and assembled onsite by a local contractor. These systems are provided with complete controls that also allow remote monitoring. Z-88® Radium or Z-92® Uranium removal systems can be utilized in any new or existing potable water system. Water passes through treatment vessels where the contaminant is removed. When the treatment media is ready for replacement, the treatment media is removed from the vessels at the site by WRT service personnel and replaced with new media. The system is then placed back into service. WRT provides for the safe removal and disposal of the spent media. Contact us to learn more about WRT’s Field Erected Systems.